View of a new security bulletproof glass barrier under construction around the Eiffel Tower in Paris, France, Thursday, June 14, 2018. 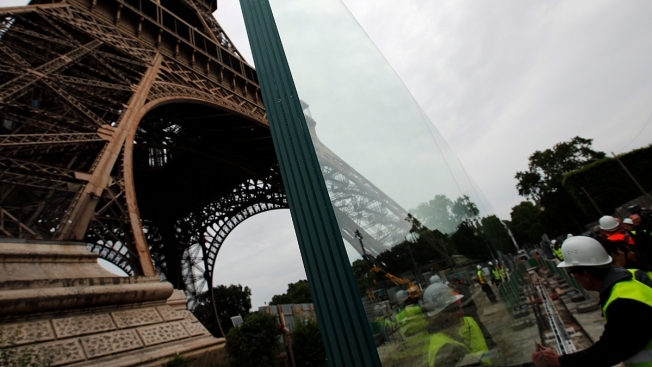 Paris authorities have started replacing the metal security fencing around the Eiffel Tower with a more visually appealing glass wall. The company operating the monument said see-through panels are being set up instead of the fences at the north and south of the famed monument that were installed for the Euro 2016 soccer event. Each panel is 3 meters high, over 6 centimeters thick and weighs 1.5 ton. Goodbye metal fencing, hello glass walls: Paris authorities are building a permanent security belt around the Eiffel Tower, replacing the current fencing around it with more visually appealing glass walls. The company operating France's most-visited monument says see-through panels are being set up at the north and south ends of the site. Each panel, made from over 6-centimeter (2.36-inch) thick armored glass, measures 3 meters (nearly 10 feet) high and weighs 1.5 tons. 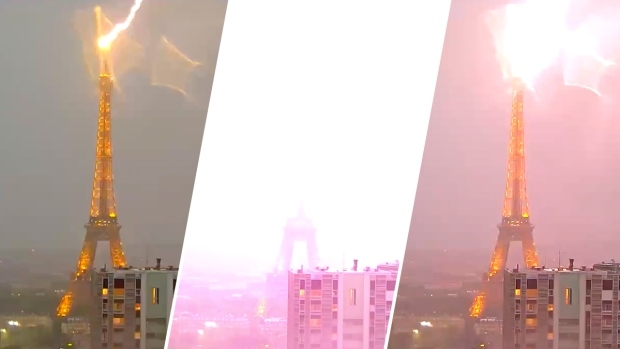 A lightning bolt striking the Eiffel Tower in Paris was caught on video Monday night, on May 28, 2018. "When you are on site, you see that the 3-meter high walls, compared to the scale of the monument, are absolutely not visible," said Jose Luis Fuentes, an architect at Dietmar Feichtinger Architects, which is in charge of the project. "It will really look as if the square (under the Eiffel Tower) was open." A New Jersey realty company says one of its signs lost during Superstorm Sandy in 2012 has been found washed up on a beach in France. Hannes Frank, 64, told The New York Times he sent an email to the realty company after finding the sign washed up near Bordeaux, France.